This week, I sewed this for a pregnant cousin. 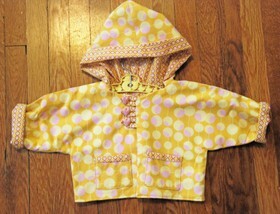 Amy Butler works for quilts and this baby jacket is quick sew. I used Amy Butler's Midwest Modern series from Westminster Rowan Fabric. I used Gold Martini and lined it with Happy Dots. The buttons are hearts. Easy one-day project. The pattern is well written and easy by Jackie Clark designs.